The No. 1 New York Times bestseller, Empty Mansions: The Mysterious Life of Huguette Clark and the Spending of a Great American Fortune, was named one of the best nonfiction books of the year at Goodreads, Amazon.com and Barnes & Noble. One of New York Times critic Janet Maslin’s 10 favorite books of the year. On the bestseller list in Los Angeles for 35 weeks. Coming to theaters in a Hollywood film. Empty Mansions is now available in four flavors: hardcover, paperback, e-book, and also the audiobook containing about 20 minutes of audio of Huguette and her cousin Paul in conversation. See the "buy the book" page for ordering information. All forms of the book now include updates on the settlement of the Clark estate. Updates are also on the NBC News page at http://nbcnews.com/clark/.. Also see there an archive of all of NBC's Huguette Clark stories. Empty Mansions debuted at No. 1 on The New York Times bestseller list for e-books, and No. 4 for hardcover books, for the week ending Sept. 14, 2013. It has been on the New York Times bestseller list for 13 weeks, and on the Los Angeles Times bestseller list for 37 weeks. 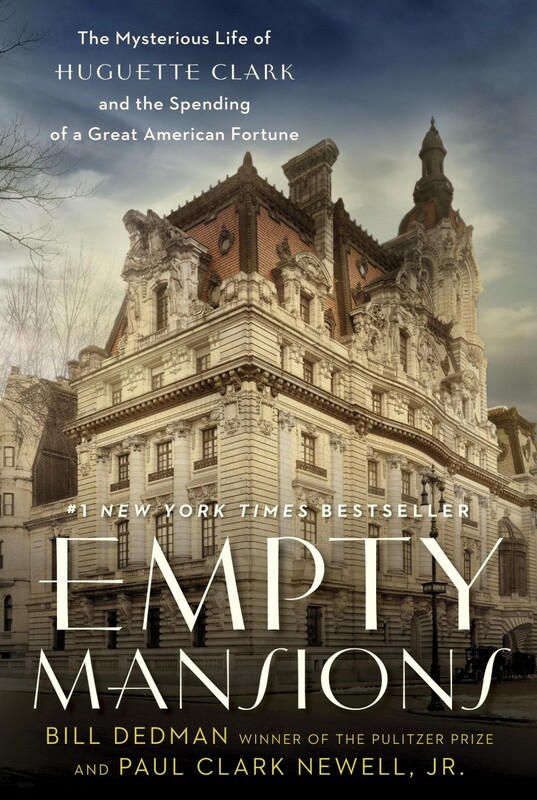 Empty Mansions also appeared on bestseller lists from Publishers Weekly, Indie Bound independent booksellers, National Public Radio, The Wall Street Journal, USA Today and Maclean’s magazine in Canada. Dedman and Newell tell a fairy tale in reverse: the bright, talented daughter, born into a family of extreme wealth and privilege, who secrets herself away from the outside world. Empty Mansions reveals a complex portrait of the mysterious Huguette and her intimate circle. We meet her extravagant father, her publicity-shy mother Anna, her star-crossed sister, her French boyfriend, her nurse who received more than $30 million in gifts, and the relatives fighting to inherit her copper fortune. Empty Mansions draws a rich portrait from conversations with Huguette, her personal papers and the testimony of her inner circle. Updated with the outcome of the court battle for her estate, Empty Mansions tells an enthralling story of an eccentric of the highest order, a last jewel of the Gilded Age who lived life on her own terms. Bill Dedman introduced the public to heiress Huguette Clark and her empty mansions through his series of narratives for NBC News, which became the most popular feature in the history of its website, topping 110 million page views. All the NBC News stories, videos and photos on the mystery of Huguette Clark are at http://nbcnews.com/clark. Bill received the 1989 Pulitzer Prize in investigative reporting while writing for The Atlanta Journal-Constitution. He has written for The New York Times, The Washington Post, and The Boston Globe. Paul Clark Newell Jr., a cousin of Huguette Clark, has researched the Clark family history for 20 years. His father and Huguette were first cousins. Paul shared many conversations over nine years with Huguette about her life and family. Excerpts of those conversations can be heard in the audio version of Empty Mansions. Paul received on Huguette's orders a rare private tour of Bellosguardo, her mysterious unused estate overlooking the Pacific Ocean in Santa Barbara.